Kyosho have introduced the new Inferno MP9 TK1 3 buggy. Tested and proven at numerous international racing events, design upgrades have evolved multiple areas of the chassis platform to a new level. 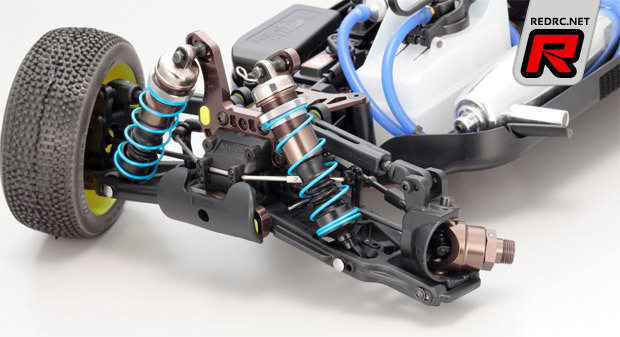 The chassis design focus is on efficient traction and is realized through short suspension arms and unique rear hubs that produce effective traction with light suspension stroke. Shock absorber design has changed from spacer setting adjustment to dial adjustment and incorporates the previously optional shock pistons with tapered holes that produce optimal piston speed and damping power over long running times. Other features include a low-height body design with less front-end resistance that generates aerodynamics for a competitive edge and stable posture through the air. With the power of the most advanced racing performance firmly in your grasp, the innovative design of the new TKI 3 puts racing glory within reach. – HD Universals – New 3.5mm thick swing shafts, much stronger than the previous version. – Heavy Duty Shock Tower – Strengthened front shock tower features a thicker construction giving you the ability to handle what ever your local track can dish out. Similar to what was used during the IFMAR 2011 Worlds. – Newly Designed – Redesigned molded battery and receiver box, which is compatible with KO propo switch. – Redesigned – Newly servo tray allowing for precise, effective and linear linkage movement. – Move Up – The radio tray has also undergone change which now allows for easy servo maintenance and replacement. – New Design MP9 Wheel – New design of the dish wheels is lightweight with optimal rigidity and supports sure traction and effective tire grip. – New Tapered Shock Pistons – Shock pistons with taper holes deliver optimal oil flow resistance and piston speed for superior damping effectiveness. – Improved King Pin Design – Longer king pin and longer flanged collar improves reliability and prevents knuckle coming loose in the event of hard contact or a crash. 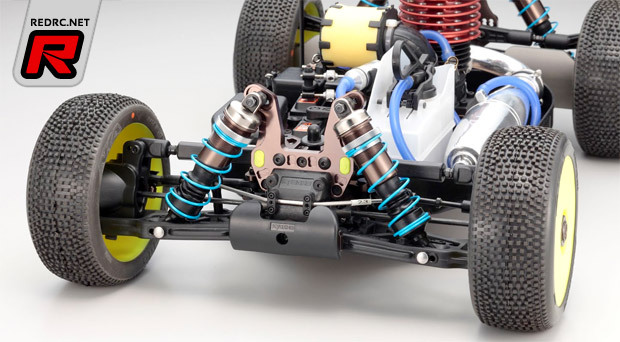 – Redesigned Arms – Redesigned and reinforced for extra strength around the stabilizer mounting holes on the front lower suspension arms. – Aluminum Wing & Radio Post – Machined aluminum wing stay posts and radio plate posts deliver improved reliability through increased strength and rigidity. – New Suspension Bushings – New white suspension bushings are now included provide you high visibility of your setup. – New Aluminum Rear Hubs – New design of the aluminum rear hubs effectively realizes shorter suspension arms to deliver reactive movement for traction efficiency. – New Body Design – new low-height body design with less front-end resistance that generates aerodynamics for a competitive edge and stable posture through the air. – New Air Filter – This high capacity air filter allows a long and consistent air feed to your engine. 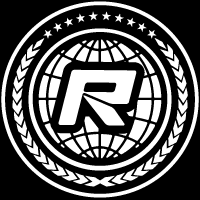 – Ultra Low C.O.G – Ultra low center of gravity, lightweight and optimal weight balance all combine to deliver the ultimate racing weapon. – More Down Force – Bolted on large wing generates powerful down force. New ribbing at the back results in improved rigidity. – 7075 Grade Aluminum – Hard main chassis made from 7075-grade aluminum, hard shock stay, big bore shocks and aluminum knuckle arms realize great strength, durability and rigidity. 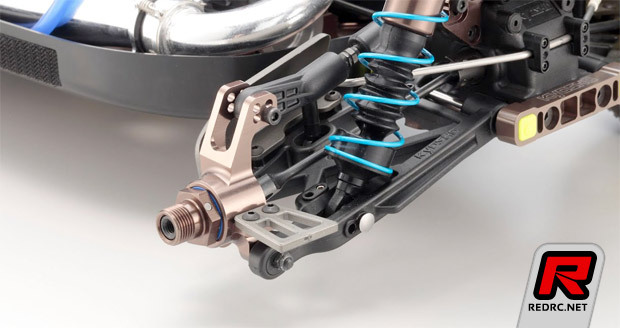 – Hard Anodized Components – The shock stay and main chassis are hard anodized for improve resistance against dirt and damage. – Composite Torque Rods – Resin torque rods fitted on front and rear contributes to moderate flexibility and smooth running performance. – Upright Servo – Servo is mounted upright for easy maintenance and is dropped 2mm to contribute to the lower center of gravity. The hard chrome finish to the metal parts is more resistant to damage and dirt than anodizing. 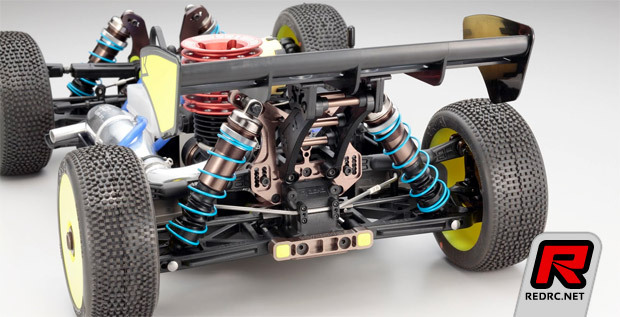 – Extremely Light Weight – The smaller differential units on front and rear with grooved cup joints, aluminum balls and the flexing shape of resin parts effectively lightens the weight while giving the chassis rigidity, more durability and strength. – New Fuel Tank – Newly designed fuel tank features finger hook for fast and reliable refueling and realizes stable fuel supply in even under severe posture changes. – Wraparound Side Guards – Grooved face in side guard matches the thickness of velcro tape and prevents dirt getting inside the chassis. Complete wraparound side guards only found on Kyosho MP9. – Equipped With Mud Guards – Mud guards on the rear arm prevent dirt entering the drive shaft and getting inside the wheels. – Hex Screws – Kit includes all hex screws enough said! – Weight Balance – Engine position moved 15mm forwards and 5mm to the center compared to the MP777. Also the height has been lowered by 1mm for ideal weight balance. – New Suspension Design – Newly developed suspension uses bushing for easy maintenance and rationalizes the setting order. – Increased Diff Case Capacity – Center differential realizes improved heat dissipating brake disc and increased case capacity for stable control through to the end of the race. – Optimal Race Settings – Fine tune for the optimal race setting with adjustments to wheelbase, tread, roll center, caster angle, toe angle and camber change. – 3 Differentials = Real Time 4WD – Features the Inferno’s signature shaft-driven 3-differential full time 4WD chassis.